We will provide the best solution to your window washing requirements at any height. If Abseil or Rope Access Window Cleaning is something you are interested in, then please see our Rope Access window cleaning section. 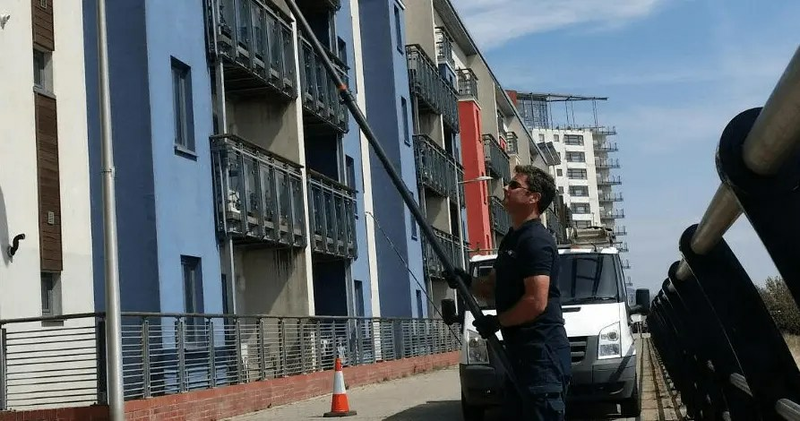 The Cardiff Window Cleaning Company is able to cover your cleaning contractor needs across South Wales including Cardiff, Swansea, Newport, Bridgend and the surrounding areas. Our staff are fully uniformed, reliable and insured up to £5 million to provide you with peace of mind and reassurance. We been awarded accreditation from Safecontractor for its commitment to achieving excellence in health and safety. Under the safecontractor scheme, businesses undergo a vetting process which examines health and safety procedures and their track record for safe practice. If you want to work with a highly experienced reliable window cleaning company then please contact us. We will be pleased to provide you with a quotation and cleaning plan to meet your needs. In addition, we also provide gutter cleans, softwash render cleaning and Fascia/PVC Cleaning at any height.